You can learn a lot in 36 hours. It’s the act of being fully immersed in something new that pushes you cleanly right out of your comfort zone, and lands you – rather messily – into a form of survival mode that is in constant conflict with the wanderlust of the traveler, and the curiosity of the journalist. For all three of these reasons, my eyes are wide open, and have taken in a lot on my weekend trip to Shoreditch, London. Yesterday morning, I caught the 6 a.m. train from Preston to London Euston, a station I was warned would be completely overwhelming. It was. But I am adamant that people at any sort of information booth, whether they want to or not, are going to help me find where I need to go. (It helps having a foreign accent, too.) The girl who helped me was lovely, and after studying and re-studying my tube map, I’ve finally understood the difference between the rails, the underground, and the overground. So, after taking the underground, I found myself in what I would describe as London’s “gastown” (although really, Gastown should be called Vancouver’s Shoreditch). The area’s crumbling buildings have been revived with artistic graffiti that beautifies the hip, trendy shops. I was headed to the Rich Mix cinema for a two-day documentary film fest. With my “superpass,” I was allowed to see any of the films I wanted, attend any of the panels, and watch any of the private screenings in what was dubbed the Delegates Lounge. I soon learned that as badly as I wanted to take in as many features as I could, I have a low threshold for how long I’m able to sit in dark rooms. Bahrain: Shouting in the Dark, Pink Saris, and The Yes Men Fix the World were the ones I watched yesterday. The first being my favourite, the third being incredibly quirky but overall a good laugh. I attended one of the two-hour sessions that boldly asked what the differences, or lack thereof, are between documentarians and journalists to a brilliant roster of panelists, including the director of Pink Saris; the commissioning editor for major series, specials, and discussions at Al Jazeera English; the managing editor of the Bureau of Investigative Journalism; a talented journalist whose documentary on Sri Lanka’s Killing Fields was nominated for the 2012 Noble Peace Prize. Between the Lines, so far, has proven to be worth the daunting trip. It’s inspiring and, as its tagline of “breaking boundaries in documenting the world” suggests, norm-challenging. After my first day, I asked the woman at the reception desk if she could give me directions to the cheap hotel I’d (proudly) found and reserved online. She kind of politely refused, explaining that walking through the Roman Road ghetto is probably not something a wide-eyed chatty white girl like me (she didn’t say this, but I swore her eyes did) should be doing in the dark. 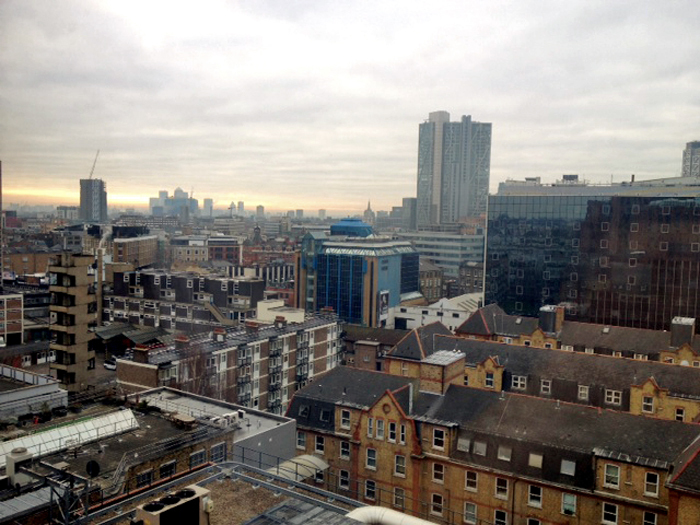 So I’m writing this long-overdue post from the comfort of a Premier Inn with a view of the city. Needless to say, it hasn’t been a cheap weekend. But you live, and you learn. And the two biggest things I’m taking away from this quick jaunt are that 1) while I may not make the best decisions right out of the ghetto, I’m very capable of finding solutions (or finding someone who can find solutions) and being resourceful; 2) I’m enormously excited at the prospect of working in film and television. Day two, here we go.